2013 IPL Matches at Eden Gardens, KKR matches at Kolkata Eden Gardens, IPL 6 T20 Cricket Matches at Eden Kolkata, 2013 IPL 6 Match Schedule at Eden Garden Kolkata. IPL-6 will be much bigger this year in 2013 for the people of Kolkata. Because, Kolkata Knight Riders (KKR) has won the IPL-5 Trophy last year in 2012 and as per the rule of Indian Premier League the winning team will get next year’s Player Auction, Opening Ceremony, Opening Match & Final Match at their home town. Thus, Eden Gardens, Kolkata will be getting the opportunity to organize the IPL 2013 Opening Ceremony, IPL-6 Opening T20 Match and also 2013 IPL Final Match. But, the IPL 2013 Player Auction won’t be done at Kolkata on 3rd February 2013. Here we will check out the 2013 IPL-6 T20 Match Schedule that will be played at Kolkata’s Eden Gardens Cricket Stadium. The Opening match of IPL6 will be played after the opening ceremony on 3rd April 2013. 3rd April 2013 at 8pm - IPL 6 Match at Eden Gardens Kolkata between Kolkata Knight Riders (KKR) & Delhi Daredevils. 14th April 2013 at 4pm - IPL-6 Match at Eden Gardens Kolkata between Kolkata Knight Riders (KKR) vs. Sunriser’s Hyderabad. 20th April 2013 at 4pm - IPL-6 Match at Eden Gardens Kolkata between Kolkata Knight Riders (KKR) & Chennai Super Kings (CSK). 24th April 2013 at 8pm - IPL-6 Match at Eden Gardens Kolkata between Kolkata Knight Riders (KKR) &. Mumbai Indians (MI). 26th April 2013 at 8pm - IPL-6 Match at Eden Gardens Kolkata between Kolkata Knight Riders (KKR) & Kings XI Punjab. 3rd May 2013 at 8pm - IPL-6 Match at Eden Gardens Kolkata between Kolkata Knight Riders (KKR) & Rajasthan Royals. 24th May 2013 at 8pm - IPL-6 Qualifier-2 Match at Eden Gardens Kolkata between ‘Winner of Eliminator’ & ‘Looser of Qualifier 1’. 26th May 2013 at 8pm – Final Match of IPL-6 at Eden Gardens Kolkata. Get to know the History of Eden Gardens, Kolkata and don’t forget to check out How to go to Eden Gardens Cricket Stadium from different areas of Kolkata. > 2013 IPL6 Full Match Schedule, Venue & Timing. > 2013 IPL-6 Kolkata Knight Riders (KKR) Match Schedule. Ipl 4 cricket matches dates eden gardens kolkata, 2011 ipl matches eden gardens kolkata, kkr matches ipl 4 2011 eden gardens, Dates Times Timings Schedule Matches IPL 4 Kolkata Knight Riders Eden Gardens chart fixtures, day night matches eden gardens kolkata 2011 ipl 4 kkr, day cricket matches kkr ipl 4 eden gardens kolkata 2011, ipl 4 kkr matches eden gardens kolkata fixtures chart date schedule. IPL-4 2011 Match Schedule has been declared and in this 2011 Indian Premier League IPL-4 Season like previous years Eden Gardens Kolkata will be the home ground for KKR IPL-4 Team (Kolkata Knight Riders). Eden Gardens, Kolkata will host seven IPL-4 2011 Matches of KKR (Kolkata Knight Riders) and those who are looking for the Kolkata Knight Riders KKR Matches at Eden Gardens Kolkata in IPL-4 2011 Tournament can read the detail IPL-4 Matches at Eden Gardens Kolkata (KKR Home Ground) Timetable below. Kolkata Knight Riders v Royal Challengers Bangalore. Kolkata Knight Riders v Chennai Super Kings. Kolkata Knight Riders v Rajasthan Royals. IPL-4 Matches at Eden Gardens Kolkata in 2011 IPL Tournament of KKR (Kolkata Knight Riders IPL Team) might get changed as Bidhansabha Vote 2011 scheduled to happen nearest dates of IPL 4 Eden Garden Kolkata Matches. Kolkata Cricket Ground Eden Gardens Stadium History Significance First Cricket Test ODI Domestic Match Details Eden Gardens Cricket Stadium Kolkata CAB cricket Association Bengal Club House Eden Gardens B.C. Roy Pavilion Gallery Memorable Event performances specialty Eden Gardens Kolkata Cricket Stadium largest biggest India World Capacity Crowd Kolkata Eden Gardens Cricket Stadium Information Location. One and Only Cricket Ground of Kolkata (Calcutta) is Eden Gardens who is the Home Ground of Bengal Cricket Team of Domestic Cricket) and Kolkata Knight Riders (Indian Premier League T20 Cricket). Eden Gardens Kolkata Cricket Stadium is the biggest Cricket Stadium in India in respect of Crowd Capacity. Kolkata Eden Gardens Ground is the second largest Cricket Stadium in World after Melbourne Cricket Ground, Australia. In case of India, Eden Gardens Cricket Stadium Kolkata is the second largest Stadium after Salt Lake Stadium of Kolkata. Eden Gardens Cricket Stadium Kolkata has the world-class Players' dressing room, Electronics Score Board and floodlights. The Club House of Eden Gardens Kolkata has been named on former Chief Minister of Bengal Dr. B.C. Roy. Kolkata Eden Gardens Cricket Ground is also the headquarters of Bengal Cricket Association (C.A.B.). • Total Capacity of Kolkata Eden Gardens Cricket Stadium: 90,000 to 1 lakhs. • First International Test Cricket Match Played at Kolkata Eden Gardens: 5th January - 8th January 1934 between India and England. • Home Cricket Team of Eden Gardens Kolkata: Bengal Cricket Team (Bangla Domestic Team), Kolkata Knight Riders (KKR Team of Shahrukh Khan of IPL T20 Tournament). • Eden Gardens Kolkata Cricket Stadium proud of Sourav Ganguly (ex-Indian Captain) and has produced many International Cricketers like Laxmiratan Shukla, W.Saha, Ranadeb Basu, Manoj Tiwary, Deep Dasgupta and many others. 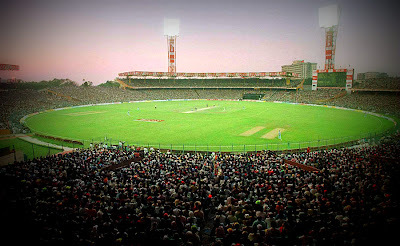 • Kolkata Eden Gardens Cricket Stadium hosted 1987 World Cup Final in which Australia won against England by 7 runs. • The Kolkata Crowd set fire in the stand when Indian Batting Lineup collapsed in the Semi-Final against Sri Lanka in the 1996 World Cup and at last the match was called off and Sri Lanka won. • In 1991 against Sri Lanka, Kapil Dev took an ODI hat-trick and became the first Indian Cricketer (Bowler) to take an ODI hat-trick, which was happened at Eden Gardens Kolkata. • Indian Spinner Harbhajan Singh took hat-trick against Australia in the year 2000-01 at Eden Gardens Kolkata ground and became the second Indian Cricketer to take a hat-trick in Test cricket. 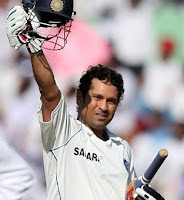 • Eden Gardens highest Individual International Test Score 281 of V.V.S. Laxman against Australia in 2000-01 where India won after being forced to follow on. The largest Indian Cricket Stadium Eden Gardens Kolkata is situated at B.B.D. Bag (Binoy Badal Dinesh Bag) area of Kolkata. The nearest locations of Kolkata Eden Gardens are Kolkata high Court and State Secretariat Kolkata. Railway Train Routes to Kolkata Eden Gardens Cricket Stadium – Those who want to come Eden Gardens Kolkata Stadium from near by places of Kolkata like Barrackpore, Naihati, Barasat, Bongaon, Gobardanga, Basirhat, Diamond Harbour, Canning, Chandannagar, Burdwan etc they can come down to Sealdha Railway Station (from North / South 24-Pgs districts) and at Howrah Railway Station (Howrah, Hooghly, Burdwan districts) and from Sealdah or Howrah Station can take Buses or Taxis towards Eden Gardens Kolkata. Metro Railway Routes to Eden Gardens Kolkata Ground – Those want to visit Eden Gardens can take Metro Railway Services from your nearest Metro Station and come to Esplanade Metro Station. From Esplanade Metro Station, you can take 10-15 minutes walk towards Eden Gardens Stadium Kolkata. During the International Cricket Matches, Kolkata Metro Railway extends Metro Rail Service to help people to reach their houses. Chakra Rail Route to Eden Gardens Cricket Ground Kolkata - Another way to reach Kolkata Eden Gardens is by Chakra Rail Service (Circular Railway Route). The nearest Chakra Rail Station of Eden Gardens is Eden Gardens. Cab, Taxi, Buses Routes to Eden Gardens Kolkata - Kolkata Eden Gardens Cricket Stadium distance from Kolkata Airport or the distance of Eden Gardens from luxury Hotels in Kolkata can be covered by Taxi, CAB or Buses. Buses to Eden Gardens Kolkata are available in large number from every location from Kolkata and near by places. Those buses going towards Esplanade, Dharmtala, Red Road, High Court, Akasbani etc are those buses which follow the routes via Eden gardens Kolkata Stadium. 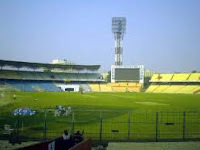 The Match on 27th February 2011 of ICC Cricket World Cup 2011 has been moved from Kolkata's Eden Garden Cricket Stadium. Total of four World Cup Cricket 2011 Matches were scheduled to be played at Eden Gardens Cricket Stadium, Kolkata and for that reason CAB (Cricket Association of Bengal) started to reconstruct Eden Garden by enhancing the look of Eden Club House, expanding the Players Dressing Room and constructing the Cemented Gallery Seats in to chairs. On 25th January 2011, the members of ICC had a visit to Eden Gardens, Kolkata for checking the condition of Cricket Ground Eden of Kolkata. But, unfortunately the construction of Eden Gardens Stadium Kolkata hasn't finished the total work. The Bengal Board of Cricket Association asked for extension of date and confirmed that the work will be finished on 5th February 2011. But, as per the rule and regulations of ICC (International Cricket Council), before a tournament like World Cup Cricket the date extension can't be possible. At last on 27th January 2011, ICC has announced that the Match of Eden Gardens Kolkata of 27th February 2011 is going to moved from Eden Garden to most probably at Bengaluru Cricket Ground, South India on the same day. This is really bad news and will affect Bengal Cricket Association Board. Now, there will be only Three World Cup cricket 2011 matches will be played at Kolkata Eden Gardens. 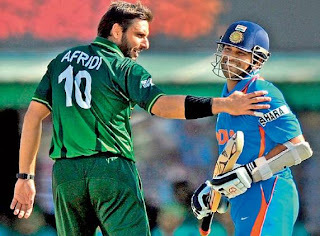 Most important and most awaited match of World Cup 2011 of Eden Gardens Kolkata i.e., India Vs England Cricket World Cup Match 2011 February 27 moved from Kolkata Eden Gardens Stadium. The other World cup Matches in Kolkata Eden Gardens in 2011 where India isn't playing and there is no Knock out Matches of World Cup 2011 at Kolkata Eden Gardens. So, it will be a big economic loss as well. The first match at Eden Gardens Kolkata of 2011 World Cup Cricket is now in March 2011 because of moving India Vs England Cricket World Cup 2011 Match from Eden Gardens Kolkata. Who will take the responsibility of this mishap and bad patch of Bengal's Cricket?